Do you want to password protect files, encrypt and secure confidential data ?. Do you want to be able to easily unlock the locked file on another computer even if the application is not installed ? Do you want an easy file locker that is very fast because you have to unlock only the specific file you want each time ? You do not have to wait and unlock the whole folder to unlock a specific file. 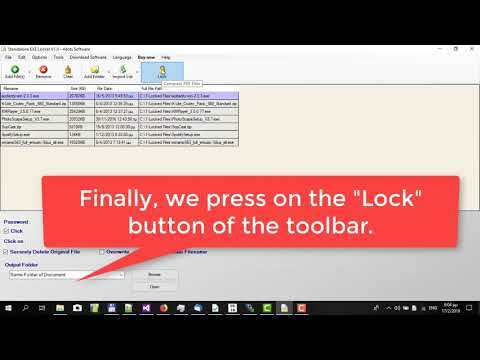 Just run the specific locked file standalone executable and unlock it fast ! Standalone EXE Document Locker encrypts files with the Triple DES encryption algorithm. Moreover, another protection mechanism is, that you can specify that when run, the application screen has to be clicked specific number of times and at a specific point of the screen (top left, top right, bottom left e.t.c.) in order to show the password entering box. Additionally, the original file can be securely deleted and temporary files that are generated are securely deleted and the original filename can get obfuscated. Standalone EXE Locker can be integrated into Windows Explorer and you can easily lock files with by right clicking on them in Windows Explorer. The application supports drag-and-drop actions. Standalone EXE Locker supports also command line usage and can be included in scripts and batch files. Standalone EXE Locker can automatically watch folders for files and convert them to locked standalone executable files automatically when they are created there. Standalone EXE Locker was added by fourdots_software in Feb 2019 and the latest update was made in Mar 2019. The list of alternatives was updated Feb 2019 There is a history of all activites on Standalone EXE Locker in our Activity Log. It's possible to update the information on Standalone EXE Locker or report it as discontinued, duplicated or spam. Alternatives to Standalone EXE Locker for Windows, Android, Mac, iPhone, iPad and more. Filter by license to discover only free or Open Source alternatives. This list contains a total of 25+ apps similar to Standalone EXE Locker. No reviews yet for Standalone EXE Locker, want to be first? Maybe you want to be the first to submit a comment about Standalone EXE Locker? Just click the button up to your right!